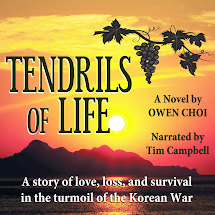 Tendrils of Life takes you through the turmoil of war in Korea at the end of World War II and the Pacific War with the surrender of the Empire of Japan. Choi writes a detailed narrative of the plight of the Korean people during the time-frame when their beloved country is torn in two by outside forces. He weaves the historical events through the eyes of his main characters as they struggle to survive the injustices and strife that war brings. Readers need not be familiar with the Korean War to appreciate the story. Choi's writing is non-linear, using flashbacks at strategic points in the novel to give us the back-story of the characters while driving the action forward in the present. The novel could easily be transcribed into a screenplay, as the historical framework, visual detail and pace of the story are not unlike a cinematic movie -- similar to other novels which have successfully been made into films such as Bernardo Bertolucci's The Last Emperor or Heinrich Harrer's Seven Years in Tibet. The overall journey through the war-torn country of the main characters -- Jimin, his little sister Misern, his soul mate Sora, his arch-nemesis Sinman and others -- is depicted with so much visual detail that I felt hunger, pain, sorrow, loneliness and despair as I read each chapter. What is unique in this story is that the main character Jimin is not portrayed as a typical hero -- he is not particularly strong nor is he brave. However, every time he looks death in the eye, his faith, love and determination to survive overcome the impossible. I was so moved by the story and enjoyed every word. I felt as though I was right there beside Jimin, Sora, Teacher Yang, Jimin's father and even Sinman. I loved how the story was brought together at the end. Knowing now that Sinman was Jimin's half-brother and the real reason there was trouble between both families brought closure for me. It made sense to have heard the different points of view from each of the main characters. In addition to the narrative, I thoroughly enjoyed the historical information interwoven between the chapters. It helped me place the story in context with the actual events of the war. 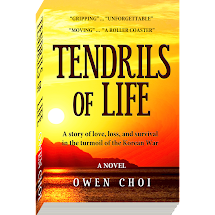 Tendrils of Life is a literary gem, a novel I recommend to readers, especially those who appreciate good writing and historical fiction. I anticipate more novels by Owen Choi and look forward to reading more of his work in the future.